It’s clear House Speaker Paul Ryan (R-WI) and President Donald Trump have a big political problem on their hands: trying to justify passage of an Obamacare replacement plan that many analysts say will result in millions of people losing their coverage. The Congressional Budget Office, the premier budgetary scorekeeper for Congress, isn’t likely to issue its estimates of the costs and effects of the Republican plan until early next week. But economists at the Brookings Institution reported Thursday they anticipate the CBO estimates will project the loss of coverage for 15 million people over the coming decade under the Republican plan. The GOP plan would wipe out most of the Obamacare mandates and taxes and replace them with tax credits, expanded use of tax-exempt health savings accounts, funding targeted to assist older and sicker people obtain coverage and significant changes in the Medicaid program for the poor. Brookings and its partner, The Leonard D. Schaeffer Initiative for Innovation in Health Policy, based their expectations on previous CBO estimates of earlier GOP. While acknowledging that there is significant uncertainty about how CBO will go about modeling every aspect of the GOP plan and determining how the different pieces would interact with one another, Brookings said CBO’s estimates could be even higher than 15 million by the end of the 10-year “scoring window,” but that it is unlikely they will be significantly lower. Perhaps anticipating a damaging CBO report, the Trump administration and congressional Republicans have already cast aspersions on the budget scorekeeper’s past work and the importance of the report expected on Monday. “If you’re looking to the C.B.O. for accuracy, you’re looking in the wrong place,” White House Press Secretary Sean Spicer said on Wednesday. 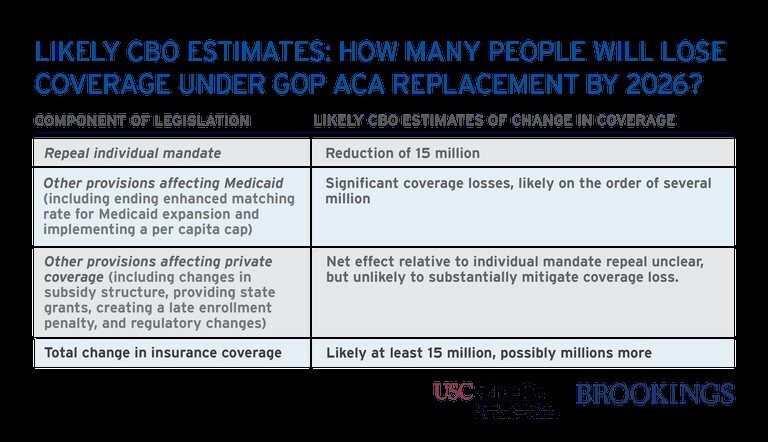 Yet the Brookings analysis and guesstimate pinpoint several factors that would contribute to a dramatic drop in coverage. The two biggest are the proposed repeal of the Obamacare mandate requiring uninsured Americans to purchase coverage and a plan to freeze and then phase out expanded Medicaid coverage for the poor in three years. The Brookings report said that without the so called individual mandate, many Americans — especially young and healthy people whose participation is vital to the financial success of insurance plans — would drop their insurance coverage. That, in turn, would drive up premiums and spark further coverage losses. CBO previously estimated that individual market premiums would rise by 20 percent under the GOP approach and that six million people would lose individual market coverage by 2026 as a result. Beyond that, elimination of the individual mandate will reduce by two million the number of people with insurance obtained through their employers. Finally, GOP plans for scaling back Medicaid coverage would reduce by seven million the number of ensured Americans — for a grand total of 15 million. The residual effects of the Republicans’ proposal for gradually overhauling Medicaid and converting it into a per capita payment to the states likely would lead to millions of more poor people losing their coverage because of changes in state eligibility requirements and sharp restrictions on funding. With so much at stake politically for Trump and the Republicans seeking to fulfill a key campaign vow to repeal and replace Obamacare, Ryan and his troops appear willing to try to ram their bill through the House in the coming weeks. Yet the plan they unveiled on Monday after weeks of secret negotiations has run into a tsunami of opposition from the health care industry, Republican governors, outside conservative groups and a potent mix of conservative and moderate lawmakers in the House and Senate. Trump has given the plan a strong endorsement and has signaled a willingness to barnstorm across the country to rally support and bend the will of recalcitrant lawmakers. Yet the president has also suggested that he is open to “negotiations,” according to Politico. And in the process he has been sending mixed signals to different factions that are greatly complicating the job of Ryan and Senate Majority Leader Mitch McConnell (R-KY) in trying to consolidate the party around the bill. The House Energy and Commerce Committee advanced a portion of the GOP American Health Care Act Thursday on a strict party-line vote, over the strong objections of the Democrats. Earlier in the day, the Ways and Means Committee completed its work on the tax-related portions of the repeal and replacement plan. Now the action shifts to the House Budget Committee where the pieces will be cobbled together and fine-tuned before Ryan, House Majority Leader Kevin McCarthy (R-CA) and the House GOP whip organization attempt to pass it on the floor within the next few weeks. Democrats insist that the Republican leadership and Trump are on a fool’s mission in promoting a replacement plan that will never pass the Senate, where the GOP holds a narrow 52-48 margin, even if they manage to get it through the House. If the CBO report is in line with the Brookings projections, public anxiety levels are sure to rise and Ryan and others will have to explain why they felt compelled to ram their plan through committee late this week before even seeing CBO’s projections. “I would think that people would want to know if their constituents would lose their insurance before they vote for this bill today,” said Rep. Diana DeGette (D-CO).